The Lotus Trolley Bag is not just another environmentally friendly shopping bag—rather, it’s an altogether new bagging system. 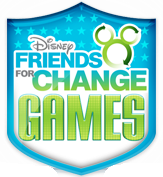 Four teams comprised of Disney stars from around the world will play on behalf of a global charity. SKOY is an eco-friendly household cleaning cloth that outlasts 15 rolls of paper towels. I am announcing the winners to 3 giveaways tonight. Good Luck!